As a spirit, he decided to be born as a handicapped man with the purpose of concentrating all his thought to the mission he had intended, the development of the theory of the Big Bang. 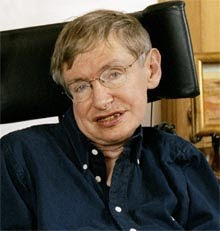 Teacher of Stephen Hawking, his Thetan or Higuer-self communicated telepathically with Grupo Elron to clarify some mistakes that his embodied part made related to the theory of the Big Bang. According to investigations carried out by the Grupo Elron, especially through telepathic contacts with Roger Penrose's Thetan. Roger Penrose was the Teacher of Stephen Hawking, The theory of The Big Bang sustained by his student is only partially correct. Part of the mistake in which Stephen Hawking incurred was due to the influence of his teacher. The spiritual part or Thetan of Roger Penrose requested to us earnestly to make known the truth about the Big Bang theory. We transcribed the dialogues with Roger Penrose's Thetan. Entity that came to dialogue: Roger Penrose's Thetan. Interlocutor: Who will come to dialogue? Roger Penrose: I am the Higher-self or Thetan as you also call it, of Roger Penrose and I have come to clarify some of the mistakes that my incarnated part made. In the physical plane 1 have a special student who became more famous than his teacher in the long run... I am talking about Stephen Hawking. Einstein had said: "God doesn't play with dice", which means that the world is not a product of chance. In a given moment, my incarnated part who didn't agree with that sentence, discovered through quantum physics that with an infinite mass and zero space we were no longer dealing ourselves with the traditional physics, but with quantum physics, and in this quantum physics there is a law called "Law of Uncertainty", and inside of it anything can arise or show up. Then, my physical part reached to the conclusion that the universe was chance. Being the universe chance, God didn't have any intervention. Then, my student Stephen Hawking developed, in his "A Brief history of time", a thesis that said that God was outside of the creation of the universe. But, of course... I didn't agree with the investigation on my incarnated part (10%) which was leading to his readers toward a total materialism, leaving God aside. Then, in my spiritual part (90%), I continued investigating and I realized that behind an infinite quantum mass and behind of that zero space, before there had been a Big Crunch, there had been a tremendous condensation of matter. This means that behind of that world there had been a previous universe, that is to say, I verified that Creation was an eternal throb of 30.000 to 40.000 million years. Therefore, the universe had not been created from nothing, but rather it had been created from a previous universe and so forth through eons. Therefore, God is out and inside the universe. He is and He is not the universe. Then, my theory in my physical plane, it had been a mistake. It had created a quantum formula to leave God outside of the universe. On one hand, I was right, because God is outside of the universe. On the other hand, I was mistaken... because God is also inside of that creation! God is the Creation, He is above the Creation and He is away from this Creation... And without God there would not be Creation...! Roger Penrose: Correct, because regrettably in the physical plane it has been demonstrated erroneously that God was not necessary in that creation... Me, at this time, as a Thetan, I acknowledge my mistake and I had no way to rectify that mistake made by my incarnated part. For that reason, I make it now through this vessel, and I affirm that before this Big Bang there was another universe, and therefore, God always had permanency due to a question of mathematical logic. It wasn't a creation from nothing; it was a creation from a previous universe... There was and there is an eternal throb. Roger Penrose: There was no initial Big Bang because God, in his perfection, created the space-time as a Moebius strip and when he created it in this way, there is neither a beginning nor an end. This partial end or Big Crunch that will come within 15 or 20 thousand million years will be the beginning of another universal cycle of 30 or 40 thousand million years. And we the spirits complete a role in the consecutive creations, because when developing more and more our conscience we elevate with our evolutionary energy an octave the total vibration of the universe. And because of that every universe is subtler than the previous one. Interlocutor: That is to say that, in this theory, God would evolve somehow along with his Creation? Roger Penrose: God doesn't evolve in the literal sense of the word, but if I had to translate a concept I would say that the Absolute "go along with" the subtle growth of his Work. Interlocutor: I understand. What happens is that some religious and/or philosophical currents say that God also evolves. Roger Penrose: If the Absolute is EVERYTHING, He IS also the perfection and can be the imperfection, but to understand that implies enormous amplitude of criterion. Some Christian centers have confused Jehova with the Absolute, saying that he was imperfect because he was evolving. And Jehova was simply an Eloah or Minor god (Elohim) who failed in his mission, because he was a victim of his ego and in that way he became a tribal, cruel and vengeful god. Interlocutor: Then Is it absolutely wrong the concept of a God that evolves along with his Creation? Roger Penrose: I repeat the Absolute “goes along with" the vibrational elevation of every Creation, but He comprise all concept and words are poor to define him. Roger Penrose: Stephen Hawking has in these moments a fabulous theory, but he is wrong when he thinks that there was only a Big Bang. And the second mistake is to believe that with this Big Bang also began the concept of Time. I say goodbye and I am at your disposal to clarify any doubt through this vessel. Interlocutor: Thank you very much, Penrose, and we promise to make our maximum effort to make known these new concepts of yours. Entity that came dialogue: Roger Penrose's Thetan. Interlocutor: Who will come to dialogue...? 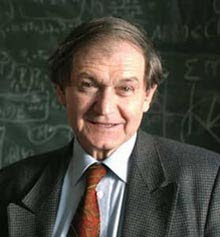 Roger Penrose: There is a very important quote, of previous centuries that says: "He who doesn't want to see it’s because he is afraid of discovering." Interlocutor: I like that quote... who said it? Roger Penrose: It is an anonymous quote. The important thing about the quote is that it shows that the embodied being sometimes has fear of discovering, because his ego is afraid of the truth... because when meeting with the Truth, that ego is integrated and it already stops dominating. Ego produces mediocrity. I said, in a previous communication that the Big Bang is not the beginning, but a beginning from many beginnings. These are cycles of 40.000 million years that take place over and over again. In every cycle the universe we know is being created. The Big Bangs are simultaneous, that is to say, 22 parallel universes are created and there are 22 parallel Big Bangs. Interlocutor: This means that it would be always the same thing? 15. billion years have passed since the Creation of this Universe and the man is not aware yet of what he is nor where he goes. There are previous creations where every incarnated being was aware of what he was in a quicker way. And the spirit in Evolution was moving of house. Roger Penrose: I will give an example, especially for nuclear physicists: let us suppose that in that previous Creation there had been planets with intelligent life in the stars of first generation (at the present time the Sun is a star of second generation, because it has 5000 million years compared to 15.000 millions of years of this universe, which means that there were stars of 1ª generation that exploded as supernovas at the end of their cycle, and others that became black holes), and let us imagine that the inhabitants of those worlds were already aware that the path to be able to evolve is to Give. In that Creation, the planes 2 and 3 would be practically deserted, because the spirits, when having eliminated the roles of the reactive mind they would not have engrams, nor would they have karma and almost all of the Thetans of the embodied beings in those planets would be in the planes 4 and 5, in the levels of Mastery and Light. Practically, Embodying in the physical plane would not have reason for being because the race would have evolved so much that the Entities would only embody in Mission in order to help other beings to evolve... Do you agree? Roger Penrose: I continue, then... But what happens if that sun of 1ª generation reach to the end of its cycle and it explodes as a supernova? Practically that world with its evolved beings would stop existing. What would happen then with all those spirits? Automatically, those spirits in evolution would embody in closer planets of other solar systems to help their inhabitants to find their path to Light. That is precisely what happened here on Earth. There were evolved spirits that came from other worlds already disappeared. And those were called "prophets." How did nobody perceive it? Isn’t maybe that now I am saying it, you wonder: How didn't I realize it before? Interlocutor: It is true, it is this way. Does That mean that the prophets don't belong to terrestrial evolution? Interlocutor: Is that your case? Roger Penrose: Sure! I embodied in an opportunity in the Pleiades System, but I have to clarify something. At the present time Pleiades are stars in formation and they don't have planets. For that reason, I must clarify the mistake made by those supposed contacted of "New Age" who say that they communicate with beings from Pleiades. That is wrong information, because I repeat that at the moment there is no life there. There was a civilization in Pleiades 5.000 or 6.000 million years ago. Afterwards that core of stars exploded and its planets disintegrated. Some of those spirits stayed in suspense in their corresponding spiritual planes, where the explosions of the physical world didn't affect them at all. Other beings embodied in closer stellar systems. And the time passed. Now, Pleiades are again in formation, because if they look at them with an optic telescope they are seen as stellar clusters and in their surroundings there are still being formed gassy planets. It is hard to imagine that when in Pleiades there was already life, The sun was being formed in this system. And now there is life in this solar system and in those stars a new cycle begins. Interlocutor: I want to take advantage of your presence to ask you about the “String theory” Is it a new theory? Roger Penrose: No, the "String theory” is not a new theory, because it was developed practically during the decade of the '60. In this theory which is similar to the Vortex theory, the quarks are fundamental particles, but they are consequences of the vortex vibration, becoming this to also be fundamental. A vortex, in a certain way, corresponds to an infinite number of elementary particles because each one of them the ability has the ability to vibrate in multiple ways. It is the different tone of vibrations the determinant that suggests the properties of the elementary particles. According to physicists, this theory is the natural simplification or the improvement of our classic theory of particles. The "String theory” says that every string vibrates in a way and each vibration forms a certain elementary particle like a quark, a lepton, a photon, etc., and there would be in this way an infinite number of particles. Besides, the theory of dimensions cannot be left aside. Interlocutor: How many dimensions are there in fact? Roger Penrose: There are 11. There are 7 dimensions folded in the "string" and 4 deployed dimensions, which are the 3 current dimensions and time which is the fourth dimension. Interlocutor: Do these dimensions have something to do with parallel universes? Roger Penrose: No, they have nothing to do with parallel universes, which are 22. They are completely different things, although there are people who believe that the mathematical dimensions are inhabited and that is another absurdity. Interlocutor: I thank you for your explanations, I will try to give that knowledge immediately. Only embodies 10% of the spirit and the 90% remaining stays in its respective vibratory plane. We call Thetan or Higher- self to that 90%. When the human being dies his spirit binds together in a 100% in the plane where it inhabits, until the spirit embodies its 10% of his entirety again. This entry was posted at Sunday, May 10, 2009 and is filed under Paradigms . You can follow any responses to this entry through the .